Half Moon Bay Golf Course. Yorkeys Knob is a delightful beachside suburb 10 minutes north of Cairns Airport and 15 minutes from the city centre. Combine a stay at Half Moon Bay Resort with tours and cruises that showcase the wonders of Tropical North Queensland. 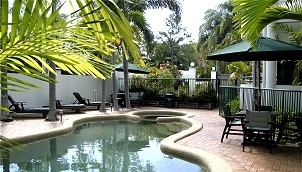 Half Moon Bay Resort Holiday Apartments are situated at Yorkeys Knob, a delightful tranquil location on the northern beaches of Cairns. Your hosts, Ellen and Rick, are on-site managers and offer a friendly and relaxed atmosphere. We have 12 fully self contained 1 bedroom apartments which are set in lush tropical gardens opposite the picturesque Half Moon Bay Golf Course. Our complex has a freeform salt water pool with spa pool attached and BBQ area for your enjoyment. Luncheon snacks are available at the Half Moon Bay Golf Club.